There are various outgoing gear options out there in the Spiral, and in this article we’re going to tackle some of the options you can go for. You will notice that some of the gear is designed for Theurgists aka life wizards. However, I tried to include various other options for other schools. This is due to the obvious fact that Theurgists dominate the game when it comes to healing. With that statement said, I’d like to point out that I don’t mean that other schools aren’t good at healing, just that Life is in the lead. A note I wish to address before looking at the options is that I will sometimes make reference to ‘critical healing‘ and ‘defensive healing‘. It’s exactly what it sounds like. Critical healing is when you disregard defenses and heal while hoping to critical. On the other hand, defensive healing is when you rely on both your defensive and outgoing attributes while disregarding critical. Additionally, I fancy myself as an avid PvE enthusiast more than PvP, however I think the options found within this article can satisfy both sides of the game. If you think we missed an important piece of gear, please don’t hesitate to post in the comments. We would greatly appreciate that. Alongside the name of every piece of gear, you’ll notice some numbers. This is the level of the item as in this guide you’ll find gear from various levels. Surprisingly, I didn’t find as much Hat options for outgoing as I was hoping for. As you’ll notice while reading through this article, hats don’t compete as much as other pieces do when it comes to outgoing. Let’s take a look at some of the options below. Ok, this isn’t really a piece of gear that screams outgoing but it is a very popular choice with healers. 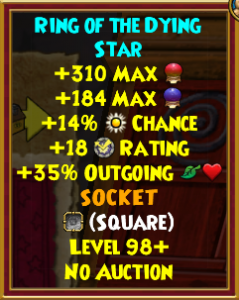 The resist makes the low outgoing worth it, as well as the +6% power pip chance. An option only for Life wizards. This hat is an option if you’re going for critical healing and not as a defensive setup. A similar option to the Jade hat except that it offers more outgoing and less universal resist. This hat is not so popular, thus it tends to be overlooked. However, it does offer some healing potential while maintaining decent resist at the same time. A plentiful amount of outgoing and universal critical mixed together, with an additional +8% power pip chance and 435 hp. Also, it’s by far the highest amount of outgoing from a hat. Only obtainable seasonally, this hat offers a balanced amount of incoming and outgoing. 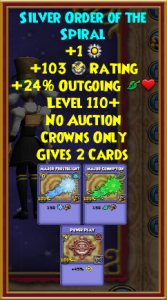 The additional storm resist is also quite the asset to this hat, and this is only the lvl 90 version of it. Image for lvl 100 hat is currently missing. Not the best option but still an option! The various types of stats it offers are interesting but not a good enough amount of any to compete with other options. 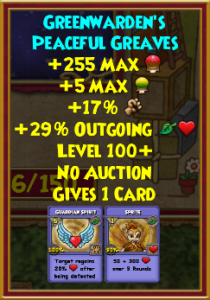 Definitely a robe for defensive healing and a very popular choice. 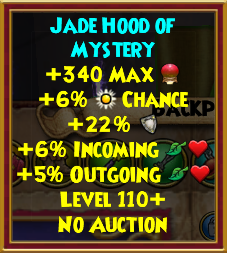 Basically a more potent version of the jade robe in all aspects except for the universal resist. At the end of the day its worth losing the 2% universal resist in order to gain the other stat boosts. Again, not the best piece of gear for outgoing, but for obvious reasons it deserves a mention. 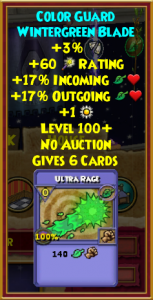 It’s the best universal resist robe in the game so far and it can be easily used for healing and/or tanking. A robe tailored just for life wizards. Most of you will remember this robe when it used to originally offer 40%+ outgoing. However, due to recent changes it now offers +27% outgoing which in my opinion is still really good. Impressive incoming and outgoing coming from this one. 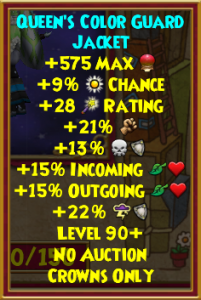 The 700 additional health, 9% pip chance and 6 universal accuracy make it quite powerful, however you’ll notice that it isn’t defensive at all. 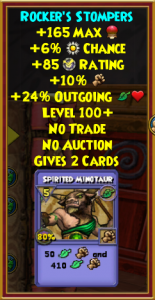 Competing directly with the faerie robe, this one offers extremely similar stats with a little less outgoing (1%) and practically the same health. Additionally, the critical makes it a viable choice for an outgoing + critical combo. Probably not your first thought when it comes to healing, but surprisingly Zeus’ set offers a fair amount of outgoing. Click the link below to see the robe variation for your own school. 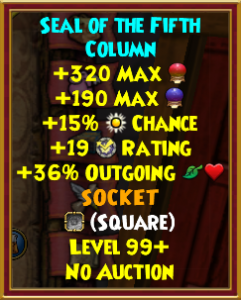 The critical block combined with the 15% outgoing make this robe worthy of a mention. 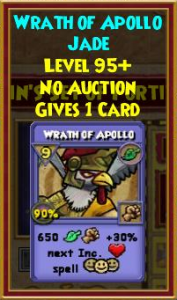 However, the lack of power pip chance with the not so impressive universal damage exclude this from being one of my main choices. Considerably not my first option, this robe is still quite a catch! The different stats you can find in it, can make a good combination when added with other pieces of gear. 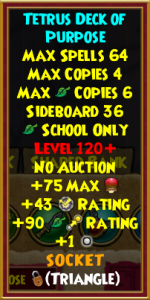 Image for the lvl 100 robe is currently missing. 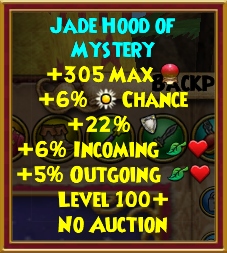 Another remarkable option with balanced stats similar to the Jade robe. However you can see a rapid boost in outgoing and a decrease in universal resist. What is truly noteworthy is the high amount of health you can find on it. 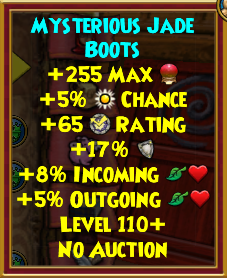 Once more, these boots are not the best outgoing source, however they’re still a popular option with healers. The high resist makes the low outgoing viable. 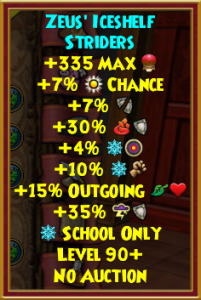 The most outgoing you can get from boots so far (+29%). 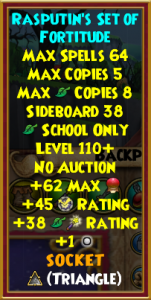 It’s truly an insane amount of outgoing, but unfortunately the other stats from this boots don’t support it. 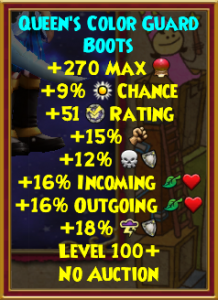 Damage, energy and health don’t really make that much sense together with outgoing, so these boots are typically dismissed as an option. A much more reasonable option than the Greenwarden boots, the Rocker’s Stompers offer a nice mix of stats a healer would benefit from. 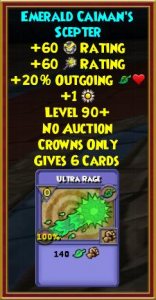 At the end of the day, only the universal damage is the odd stat. An amazing pair of boots that is more set towards critical healing rather than defensive healing. If that is what you’re going for, then this is the option for you. Quite an ideal option for critical healing. However you have to be quick on your feet or else you will be wiped away fast due to the lack of defenses. A weirdly balanced pair of boots. Why weirdly? Because it is defensive and offensive and good for healers as well. Need I say more? Truly though, the stats are quite decent. Probably not your first thought when it comes to healing, but surprisingly Zeus’ set offers a fair amount of outgoing. Click the link below to see the boots’ variation for your own school. 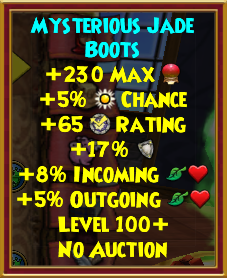 A similar option to the Jade boots except that it offers more outgoing and less universal resist. These boots are not so popular, thus they tend to be overlooked. However, it does offer some healing potential while maintaining decent resist at the same time. More of an honorable mention rather than an actual option. The unfortunate thing here is that it misses defensive qualities and it can’t be considered good for critical healing either. Barely any noticeable difference between one and the other. 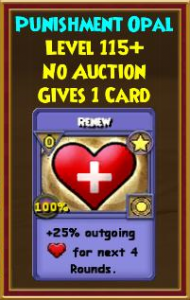 Still this is my all time favorite option for defensive healing. Thanks to Mike Castle in the comments! 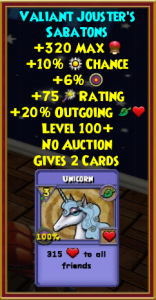 This wand is one of the best options for critical healing in my opinion. 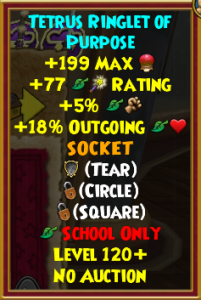 At level 100 it offers 95 critical and 20% outgoing which could compete against the Silver Order of the Spiral (that offers defensive healing) when it comes to effectiveness. 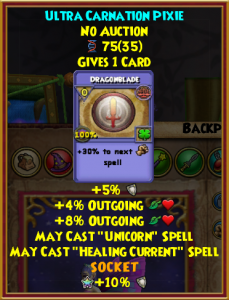 An extremely balanced wand for both critical and defensive healing. 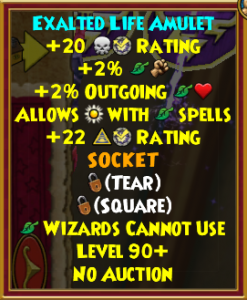 Originally obtainable from the Skyvern’s Hoard Pack, this wand is now a unique drop from Ixcax at lvl 90 only. This mandolin is another plausible option for defensive healing. 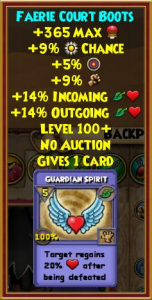 Additionally, the Guardian Spirit item card can be a good asset for non life wizards using this wand. 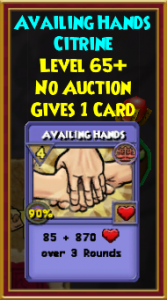 Do note that this image is of a lvl 70 version of this wand. 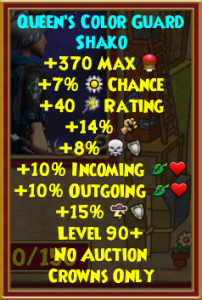 The lvl 100 provides you with 105 critical and 15% outgoing which are amazing for critical healing. 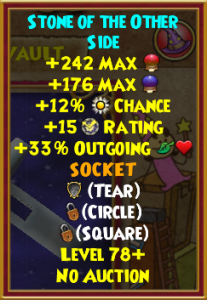 A great critical healing wand with some additional (pointless) pierce. The balance between incoming and outgoing is quite pleasing as other gear pieces tend to miss incoming stats. Definitely the best option you could go for if you don’t want to spend a penny and get good critical healing at the same time. Definitely one of the countless secrets of the spiral! The Root of Spring is the most entertaining option of them all. Unfortunately, it only offers +12% outgoing as stats but the chance of having a may cast Rebirth is quite unique! 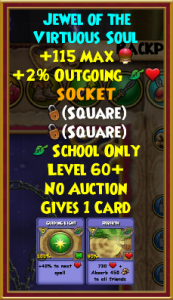 I like to refer to this as Schrodinger’s athame, because picking an athame can be both easy and not so easy at the same time. 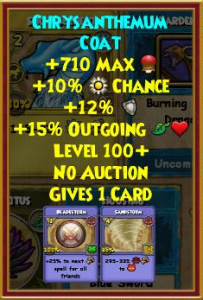 My 3 go to outgoing athame choices are listed below. However, this can be a difficult choice as all of them have their different perks. 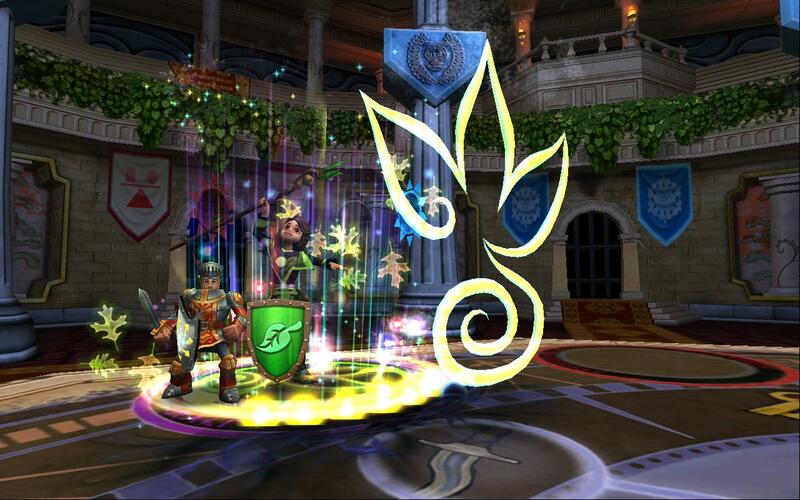 Morganthe’s athames offer a variety of useful stats for healing, such as power pips, block and of course outgoing. 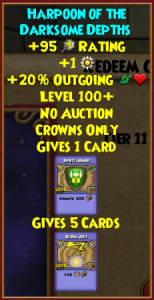 Not to mention the 4 precious jewel sockets, unlike my other 2 athame choices. 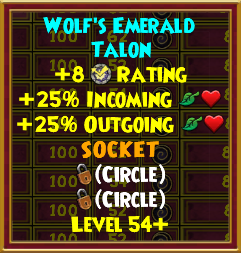 Wolf’s Emerald Talon offers the most outgoing out of them all. 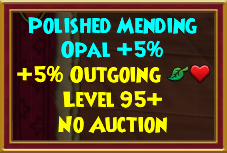 It can get a total of 35% outgoing if you socket 2 Polished Mending Opals. 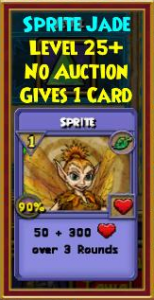 However, it lacks other stats like health and power pip chance. 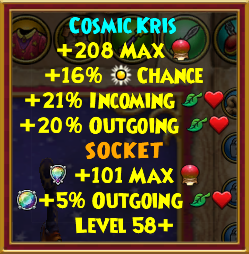 On the other hand, the Cosmic Kris is a pretty balanced option, but Morganthe’s will always be my personal favorite due to the extra stats and sockets. In conclusion, the choice must be made by determining which stat you prioritize. You’ll face a simple choice when it comes to amulets. 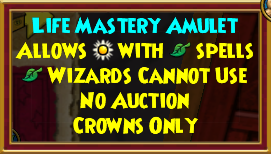 If you’re NOT a Life wizard then you need to equip an amulet that provides you with a life mastery. 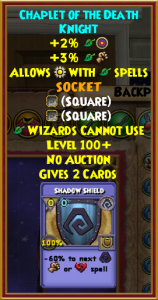 On the other hand, if you are a life wizard then there are 2 choices, Rasputin’s amulet and the amulet from Zigazag. If you’re familiar with both amulets, right now you’re probably saying that it’s an obvious choice. 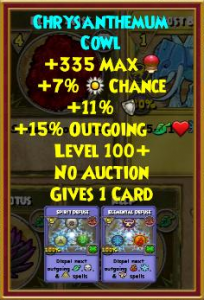 Rasputin’s amulet simply offers much more defensive stats, but Zigazag’s offers the additional outgoing which is definitely worth the mention. This piece of gear is another tricky choice! When someone mentions the words ‘outgoing’ and ‘ring’, 4 main choices come to mind. 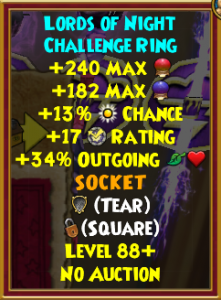 The rings dropped from the worlds of Avalon, Azteca, and Khrysalis. 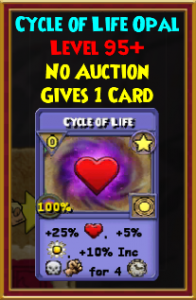 On the other hand, the new level 120 Life ring dropped from Mirage offers a balanced mix between critical and outgoing which can be quite useful for non defensive strategies. Whatever school your wizard is, Omen’s decks are what you should go for! 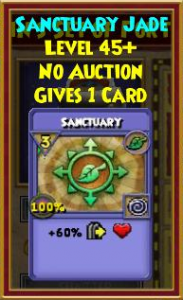 The treasure card space and additional stats it provides are a huge advantage. Another plausible option would be the Rat’s decks which are extremely similar, but offer slightly (barely noticeable) decreased stats compared to Omen’s decks. 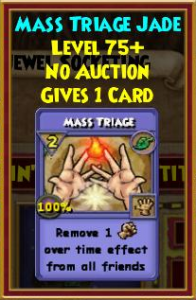 Also, that extra triangle slot on both decks offers quite some interesting jewel options, such as the ones you can see below. 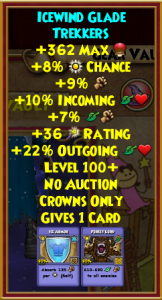 You should know that most of the listed jewels can be obtained from Jewel Packs in the Crown Shop and jewel blossom plants, but you can also get them through other options that are linked by clicking on the images. 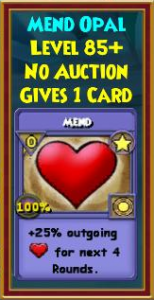 However, you can go another way and use one of the new decks from Mirage which instead of critical offer pip conversion. 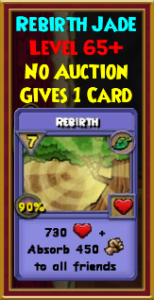 This could be good for instances such as when you use a Rebirth and want that pip back. 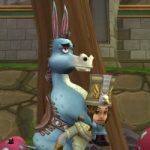 Not that much of an option when it comes to Mounts. 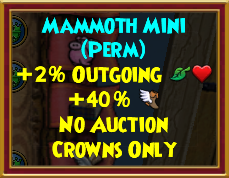 Currently there is only the one mount that provides you with outgoing, the Mammoth Mini! 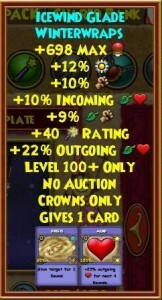 You can get it as a reward from Warlord Minak in the Jeweled Slopes, Polaris or buy it from the Crown Shop for 9000 crowns. This is a difficult part unless you’re one heck of a pet expert (not me)! 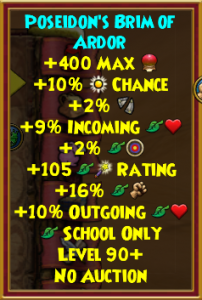 However, I do know a thing or two about what to get in order to obtain a healing stat pet or even more the best healing stat pet. 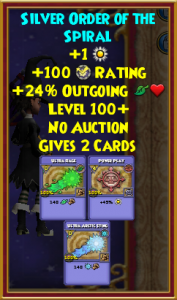 Below you can see a pet I was able to make with near max stats thanks to Nessa Raventhorn on central. The 2 talents you’ll be needing are Healer and Medic. 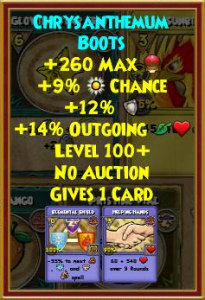 If you want the absolute best healing stats from a pet you need to mix in a few selfish talents in your pool. After some research, the best 4 I could find were Cautious, Mighty, Thinkin’ Cap and Vigorous. They all boost either strength, will or power, or two of the three. Therefore, you might be able to get +11% outgoing from Medic and +5% from Healer. 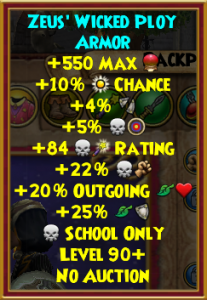 Normally you can get +8% from Medic and +4% from Healer if the pet has max (or near max) stats. 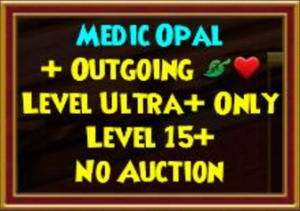 Additionally, if you require a certain talent that didn’t manifest till you hit Mega, you can try finding a jewel version of the talent like you can see above with Spell-Proof. Here comes trouble! 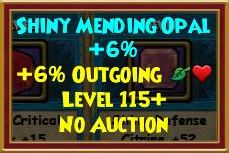 If you want to obtain the absolute best outgoing stat, then you will need +6% Shiny Mending Opals. 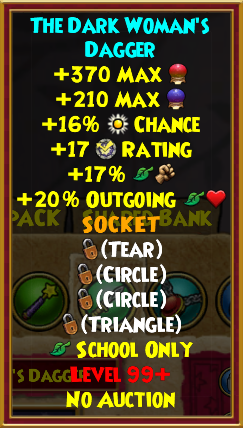 These jewels fit in circle slots so you can currently have up to 3. That’s 18% extra outgoing healing! 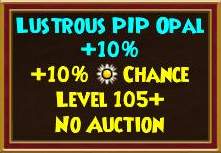 On the other hand, you can use the old Polished Mending Opals +5% which are slightly more common at the moment. After looking at all those options, what would I even propose to you? There are many good combinations you could go for. My personal setup on one of my life wizards is full Jade set, Silver Order of the Spiral, Morganthe’s athame, the Rat’s amulet, Stone of the Other Side ring, the above pet and Omen’s deck with a pip jewel socketed to it. What I just listed doesn’t really scream ‘outgoing’ but that’s the thing! You don’t really need to get a crazy amount of outgoing. Keep in mind that you need other stats to survive and be able to heal yourself and your teammates. Only one question is left to answer, what is the maximum amount of outgoing possible? The answer may surprise you! The absolute maximum (that we know of) is 192% for a life wizard and 182% for a non-life wizard! What are your thoughts on the gear options? 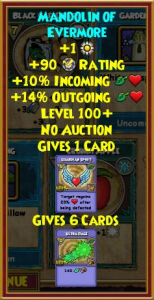 ik a possible pet set up of 5% 9% outgoing may cast pigsie spell proof 10 defy 5 may cast cycle of life and greedy talent needless to say the pigsie jewel is needed 184 for non-life wizards with 25% possible aura increase and pigsie cast is pretty good on a tank (currently tank on a death). Are the 9% and 5% obtained without any selfish talents? Hi again. My only critic of this article is that it is for life. Not showing some other options for schools hurts. I want to try out a death jade set up so I can use the spooky bundle death cards. Any suggestions? What about other schools (except storm maybe)? The only thing that is covered only for Life wizards is the deck. This is my preferred build on some of my non-life wizards. 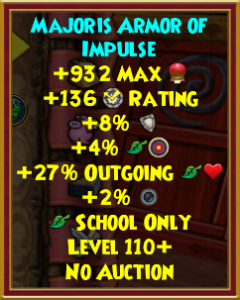 Although, I sometimes prefer the Hearsteel athame over others to focus on resist. 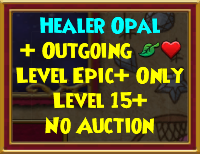 Can the 6% Mending Opal be obtained in any jewel pack? Yep! 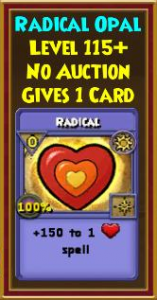 It can be obtained from the life jewel pack. 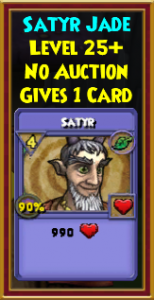 Atlantean Bundle has some descent outgoing and resist. You even get some attack, pierce and other stuff. 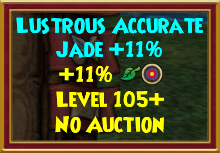 Combine it with the spooky bundle and you have a cheap jade bundle.